I purchased this little wooden plaque with decoupaged country scene at the thrift shop for 50 cents. I removed the decoupaged picture with vinegar and water in a spray bottle, a scraper and my fingernails too. I scored the picture like you would wallpaper to get the vinegar water under down to the glue. It didn't take too long. I then sanded the plaque. Here is the plaque painted with Annie Sloan Chalk Paint in "Pure White". Here is the plaque after distressing with sandpaper. I love how the corner details and edges pop! I added a Graphics Fairy chocolate image with the Mod Podge Image Transfer Method. I then waxed the plaque with clear wax. I love adding these Tim Holtz craft embellishments to my projects. I simply glued on this metal key hole with E6000. An easy and very inexpensive decor piece from an outdated thrift shop plaque. 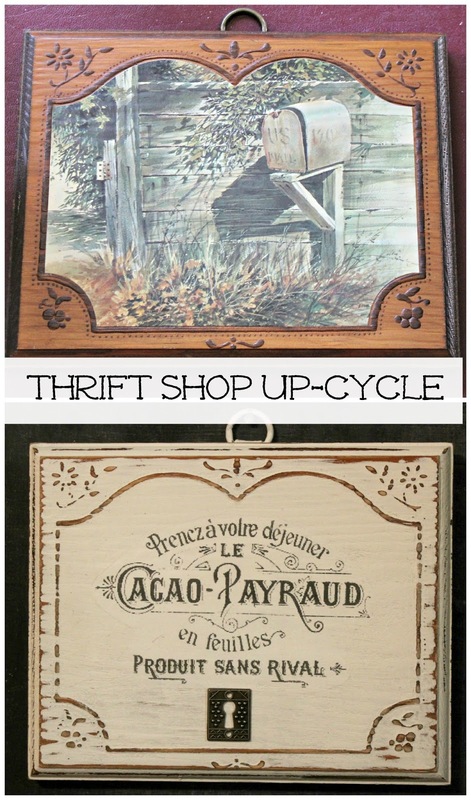 Love the end result of your thrifted plaque! I really must keep my eyes open for things that other people discard. I like the look of these old plaques when they've been redone. I have a few waiting similar transformations...but haven't done a thing yet! I do wonder though-- what all the fuss is about french wording (assuming that is french) Wouldn't it be just as pretty with english words...in similar fonts? ...just asking, because my luck? I'd print something out thinking it's pretty and it might have some raunchy words or something really tacky!!! Really made a pretty and enjoyable wall hanging now. Good job. I love the finished piece! It turned out beautiful Love how the distressing brings out the details. You go girl! The caulk paint is wonderful.